Happy Holidays: I am the surprise guest artist on SpookyTimeJingles! I am the surprise guest artist on SpookyTimeJingles! I can now tell everyone what I have known for quite a while, I am the surprise guest artist on SpookyTimeJingles! I was very surprised and honoured when asked to be a guest artist. Thank-you, Dani! 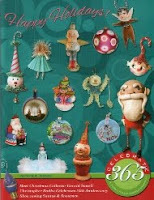 Here are a few more ornaments for sale similar to what I have on the SpookyTimeJingles site. Antoine loves marzipan and has taken two of those tasty tablets. "One for now and one for later", he says with a twinkle in his eye. They will last all of ten minutes if I know Antoine. Antoine is a composition candy container with papier mache covered wire arms. His green party hat is made from a double layer of hand painted rice paper. 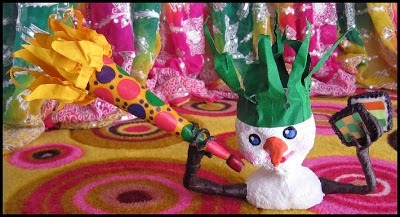 The party horn in his right hand is created using hand painted papers. The top of his head is open to place treats inside. When you are small everything is bigger, including his paper hat that is waiting to slip down over his eyes! Lucien is eager to see what is inside this Christmas cracker but first he would like to pop that chocolate flower into his mouth. Lucien is a composition candy container with papier mache covered wire arms. His party hat is made from a double layer of hand painted rice paper. 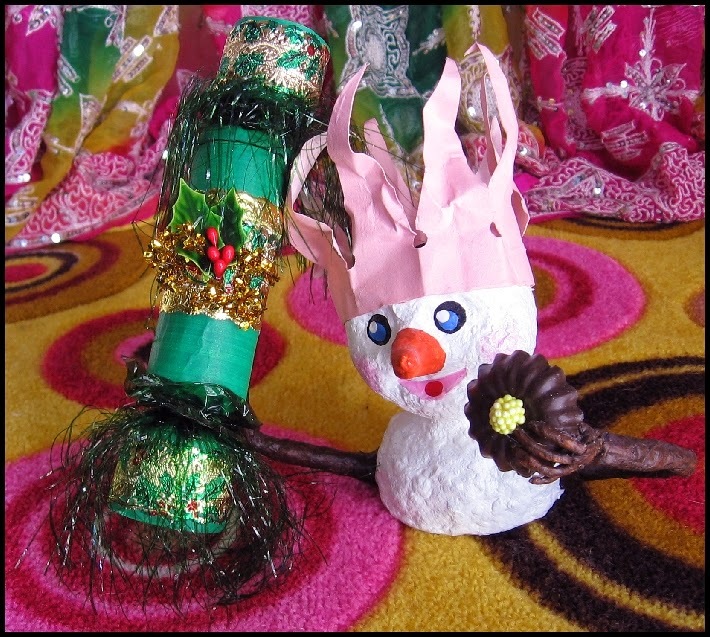 He is carrying a handmade Christmas cracker in his right hand. That Christmas cracker is also candy container. Gently hold it at the top and lift the cracker end out of the cracker body to reveal what is inside. It is created from hand painted papers, vintage fringed cellophane candy wrappers from Spain, vintage cake foil trims, vintage holly and gold chenille. The top of his head is open to place treats inside. In his left hand is a chocolate flower cast from a vintage chocolate mould. In flower's centre is a vintage floral pip. The top of his head is open to place treats inside. 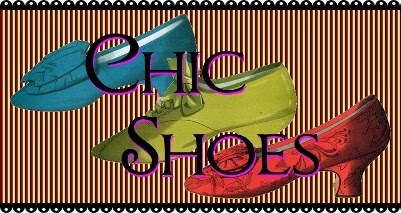 "Chic Shoes" proudly presents the "Sugar Toes Collection" just in time for the festive holiday season. This composition candy container ornament is covered in raspberry glass sugar crystals. A sprig of vintage mistletoe, its stem wrapped in vintage ribbon, rests on the front of the shoe. The edge of the shoe is trimmed in vintage chenille. The ornament is approximately 6" from the top of the wire ring to the sole of the shoe and approximately 5 1/2" wide from the toe of the shoe to the farthest point of the wire ring. Treats and candy can be placed in the ornament. 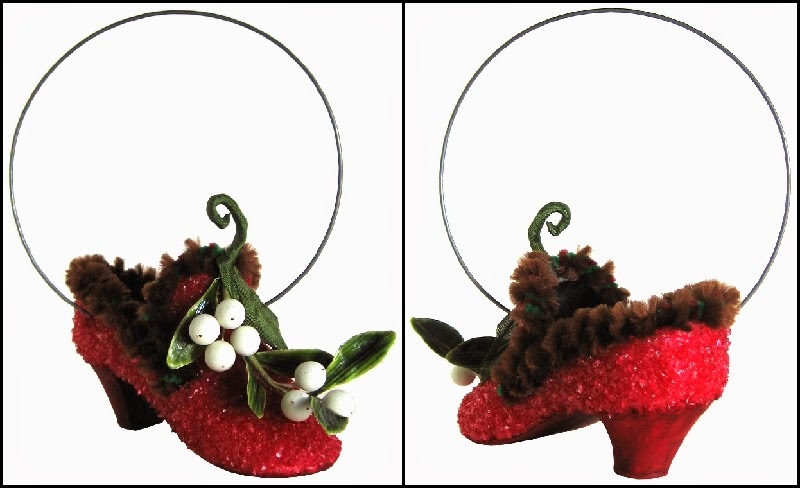 Go to my Etsy shop to add "The Mistletoe Shoe" to your collection. 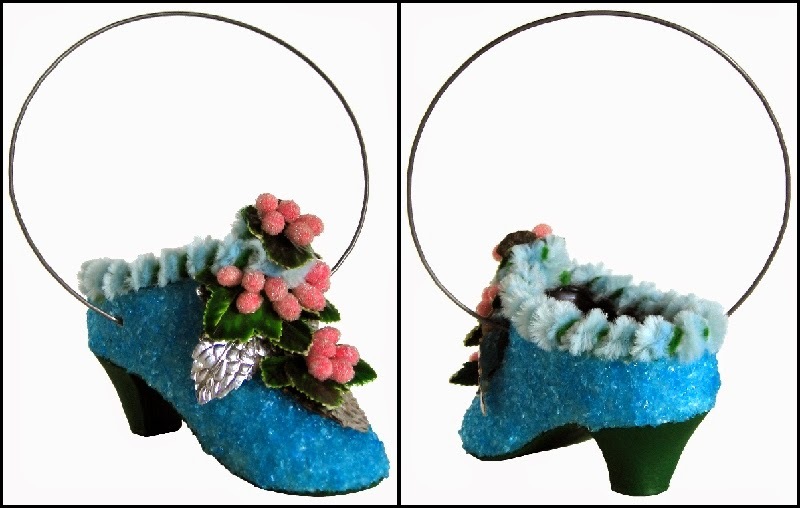 This composition candy container ornament is covered in blue glass sugar crystals. Vintage green lacquered ivy leaves with frost encrusted berries cascade from the top of the shoe down covering the vintage silver leaf. The edge of the shoe is trimmed in vintage chenille. The ornament is approximately 6" from the top of the wire ring to the sole of the shoe and approximately 5 1/2" wide from the toe of the shoe to the farthest point of the wire ring. Treats and candy can be placed in the ornament. Go to my Etsy shop to add "The Diamond Berry Shoe" to your collection. Welcome to STJ Len! Your new work is wonderful!